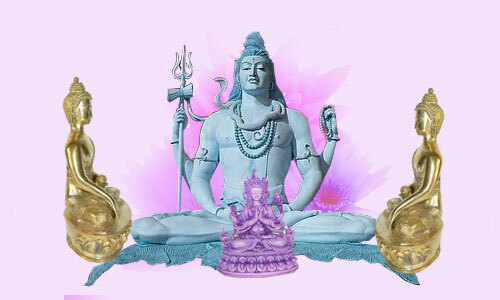 Indian Divinities India has been the cradle and shelter of numerous religions. Hinduism was born there and there it developped, as well as Buddhism that later migrated to other countries, to China and Japan mostly. Jainism, Zoroastrism, Sikhism, as well as Muslim and Christian religions, have a more limited presence but can still be found there. The Gods venerated in India are numerous, but Hinduism unifies all the various channels of adoration into a unique Divine principle: Brahaman, the God of no shape or attribute because universal and infinite. The multiple manifestations of the Unique Divine Principle as differnt Gods are in fact a means of supporting human beings in their comprehension of the Ultimate God. Kali, warrior goddess overthrowing the demons to protect the faithful. A multitude of other Gods exist, such as Ganesh, the son of Shiva and Kali, God with an elephant head and a human body who protects tradesmen, travellers and scholars. Or God Hanuman who is at the same time General of the Army and monkey fighting demons. He is a scholar and sometimes a doctor.